A panel of 13 judges on the U.S. Court of Appeals for the Fourth Circuit in Richmond, Va., Thursday (Feb. 15) declared Trump’s Muslim ban (3.0) illegal and unconstitutional. The appeals court in International Refugee Assistance Project v. Trump stayed its decision pending resolution of a related case that is already at the U.S. Supreme Court. That case, Trump v. Hawaii, will be argued in April. “When we compromise our values as to some, we shake the foundation as to all,” Chief Judge Roger Gregory said in the majority ruling. Five of the nine judges in the majority also found that the challengers would succeed on their claims that the ban violates provisions in federal immigration law. “The Fourth Circuit’s decision is the latest blow to the Trump administration’s ugly white supremacist agenda,” said Senior Litigation Attorney Gadeir Abbas of the Council on American-Islamic Relations (CAIR). 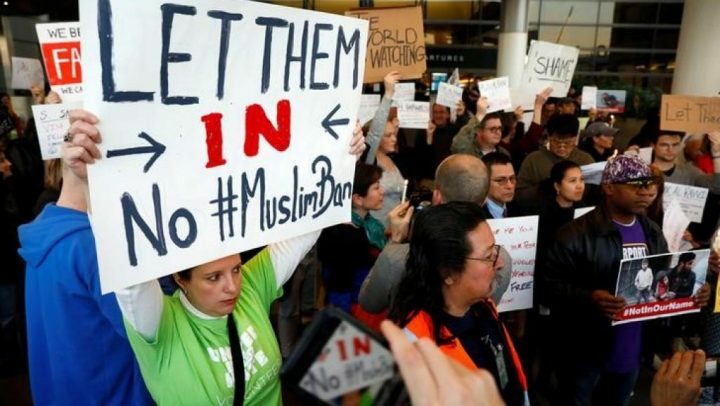 “We are pleased that another court has recognized the enduring harm that American Muslims are suffering due to discriminatory and unconstitutional policies put forward by the Trump administration,” said CAIR National Executive Director Nihad Awad.